I wrote a little while ago about the “salesforce.com mafia”. One of those I profiled back then was Okta founder Todd McKinnon, I spent some time talking to McKinnon the other day, in advance of the release of Okta’s free trial of its SSO product. The timing for our discussion was pretty good, only a few days ago VMware launched Horizon, another SSO offering. McKinnon explained to me that the reason he set up Okta was seeing, during his time at salesforce, the real need enterprises have for a solution that handles both SSO but also the complete identity management space. I asked McKinnon how he expected to compete against all the other SSO offerings from the likes of VMware and OneLogin, he explained that, in his experience, SSO is only part of the problem. At an enterprise level he believe that a solution that covers the full identity management spectrum, will always be preferable. To this end Okta covers the identity spectrum, from Active Directory integration to new employee workflow. 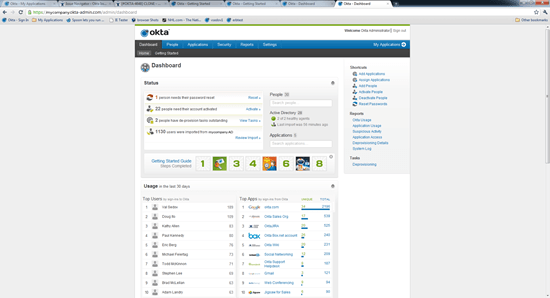 The Okta offering looks like a really nice SSO/identity implementation. of course there’s a number of those in the marketplace and Okta needs something special to differentiate itself from the competition. Quite possibly the salesforce connection might just be that thing, it’s not a stretch to imagine salesforce showing some interest in Okta now that it really is trying to move more deeply into the enterprise beyond just CRM. Update – Okta pointed out to me that the free trial is actually of Okta’s full identity management solution. While they offer an SSO version of the product at the lower end, the free trial is much more than that and includes comprehensive functionality in user management, provisioning, de-provisioning, etc. to try out for 30 days.